Honduras’ National Day is always celebrated on September 15th. It commemorates the independence of the Central American provinces from Spanish rule in 1821. Although September 15th is the actual date, the celebrations continue all month long. Either there is the preparation for a celebration or the celebration itself, so that there always seems to be something happening related to this important event. All of this is taken very seriously by those involved and almost everyone is involved in some way. Since we live in the city of Juticalpa, we were able to witness all of this first hand because much of it took place in the park near the Cathedral. For example, every day when they would lower the Honduran flag the national anthem was sung by anyone passing by. People would stop with their hand over their heart and sing until the flag was lowered and folded. It was an inspiring image of national patriotism. Also, ringing the square were tents with all manner of delicious local food prepared on site for those just passing by or for those that came specifically to eat. There were four days dedicated to parades sponsored by all of the schools in the city. Our schools participated in three of them. Wednesday was for the Pre-Kindergarten and Kindergarten students, Thursday was for the rest of the 1st through 6th grade students at our Santa Clara school and Saturday was when both of our high schools participated. 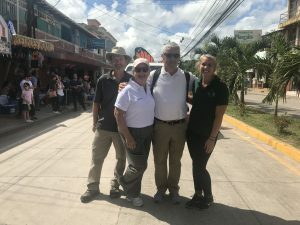 I marched on both Thursday and Saturday along with all of the other volunteers and staff at the schools and the Olancho Aid Foundation office. 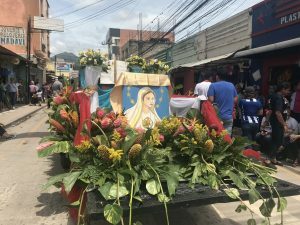 There were marching bands and floats, twirlers and ribbon dancers, and both traditional music and dancers which all reflected some aspect of Honduran life, past and present. To say that it was very colorful would be an understatement. The float from our high school included a picture of the Blessed Mother by virtue of the fact that we are all Catholic schools, and she was surrounded by gorgeous bouquets of the most beautiful flowers. A real work of art. 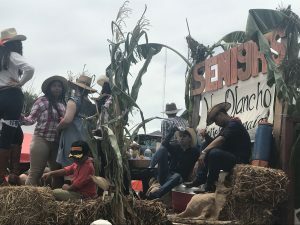 All of the volunteers shared the job of carrying a banner, but our seniors carried the day with a float that was the size of a semi and depicted the agriculture economy and cultural background of Olancho. It included all of the seniors in cowboy dress as well as hay bales, cornstalks and even a band of musicians from a neighboring village that played traditional music while the seniors danced. They seemed to take the party with them all along the parade route and those watching really enjoyed the show. Because of Independence Day we had Monday and Tuesday of last week off from school. Since it was a long weekend, we left by bus on Saturday and traveled to the largest lake in Honduras for a two-night getaway. Lake Yojoa is a beautiful lake bounded by a nature preserve. We stayed at a lovely micro-brewery that had great food and comfortable yet rustic lodging. 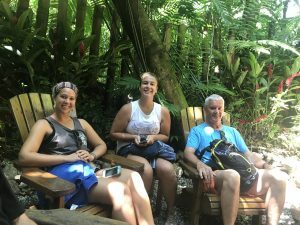 They had planned activities and we were able to participate or not as we liked, but there was a trip behind a waterfall, some kayaking and a day hike in the nature preserve to name a few of the ones we chose to do. The nature preserve had some of the most beautiful flowers that I have ever seen outside of a botanical garden. Some of us are planning a return trip in October. 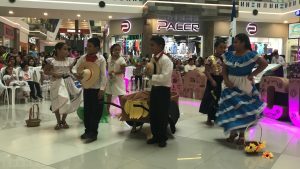 The final tribute to Honduran Independence was on Friday night at the mall. The center of the mall has a large atrium and stage similar to the ones we see in the U.S. We gathered there after school with staff, families and friends to watch our students perform skits, songs and dances. It is heartwarming to see the talent and national pride exhibited by so many of them. We were very much entertained and inspired by their pride and dedication. I was blessed to be here at this time to witness this outpouring of national pride. It was truly one of the best ways to get to know the people and the culture that I have come to share. As always, I send my love from Honduras.